But there's just one Original Farmers Market—one that's open every day, all day, where you can find purveyors of fresh produce, poultry and other meats, cheeses, candy, baked goods and dog treats, toys, hot sauce, hats, and all kinds of other stuff. And that's the one on 3rd and Fairfax. Probably most visitors to LA know it as "that place next to The Grove," but the Original Farmers Market, true to its name, predates the open-air shopping centers of Southern California as well as even supermarkets. Before the Farmers Market at 3rd and Fairfax, there was no "one stop shopping"—so you had to go to the meat guy (in days before butchering was a thing), the milk guy, the bread guy, and so on. But it wasn't always about farm-fresh produce (though, at the time, farm-to-table was really your only option) because the property had an intriguing history even before the market's opening with 18 tenants in 1934. In 1880, A.F. Gilmore bought two dairy farms in the former Rancho La Brea (much of which ended up in the hands of Henry Hancock, of Hancock Park fame), one of which included an unfinished adobe house that had been built in 1852. It was so sprawling (extending as far as present-day Pan Pacific Park, CBS Television City, Whole Foods, and the "Gilmore Station" shopping center across the street, the site of the former "Gas-A-Teria") that it earned the nickname "Gilmore Island." While drilling for water in 1900, Gilmore struck oil, and how! He replaced his cows with oil derricks, and suddenly got into an entirely different kind of business—one that allowed him to take charge of paving LA's dirt roads with the petroleum he'd extracted from his field. "Someday you'll own a horseless carriage. Our gasoline will run it," Gilmore promised the public, and by and large, he was right. Funny enough, when he started out, he was delivering oil in horse-drawn trucks. But eventually, his empire expanded, and he became known for his brightly-colored gas, in shades of "Red Lion" and "Blu-Green," that you could get pumped at one of the many Gilmore gas stations that dominated the car culture streets of Southern California. ...filled with various artifacts and memorabilia and adjacent to an interpretive historical display about Gilmore the Flying Lion (a real living lion that was kind of the company's mascot, and actually flew in airplanes to make personal appearances). Now, as the City of Los Angeles started moving west and surrounding the Gilmore property, city regulations changed—and in the 1920s, the oil drilling stopped. But while Gilmore continued to fuel the horseless carriages of Southern California, the family owned this giant tract of land that they had to figure out something to do with. And boy did they ever. Although it's now known primarily as a shopping and eating destination, that plot of land was once home to a drive-in movie theater, Gilmore Bank (now Grandpoint), Gilmore Field for the Hollywood Stars baseball team (LA's first and only pro team until the Dodgers left Brooklyn), Gilmore Stadium for the L.A. Bulldogs football team and motorcycle and midget auto racing...the list goes on. Now, the structures of the actual Original Farmers Market that are still standing are a kind of amalgamation of decades of building upon what was previously there—constantly improving and expanding. Unlike the mobile and modular neighborhood farmer's markets that pop up once or twice a week, the stalls at Original Farmers Market are permanent—though their leases are still renewed on a month-to-month basis. This is where Jimmy Shaw's Loteria got its start—as basically a taco stand with stools. ...and then sit anywhere out in the open air—all day, if you like (or as long as you can afford to park). ...and even Pinkberry and Starbucks (marked by the market's original clock tower from 1948). At Monsieur Marcel, you can purchase all your French market essentials to carry out—like wine, mustards, jams, spices, honey, and madeleines. And then you can have a nice lunch or dinner and a glass of wine at their sit down restaurant with table service. ...and which serves the world's best pancakes, with melted butter and syrup, 24 hours a day. Share a full or a short stack with friends, or get just one single pancake and keep it all to yourself. So many new places have popped up recently that try to mimic the vintage of the Original Farmer's Market—and even the A.F. Gilmore Company has licensed the brand out to a concessionaire in the Delta terminal at LAX. I guess that speaks to the timelessness of what they've got going on there. And although they company has leased some of the Gilmore Island land to other tenants (like The Grove), they say that the Original Farmers Market is going nowhere. Which is a good thing, because everybody needs somewhere to go when you don't have anywhere else to go. That's what the Original Farmers Market has been for me since I moved to LA five years ago. Meeting a friend? 3rd and Fairfax. Killing time? 3rd and Fairfax. Hungry for something but don't know what? 3rd and Fairfax. Late at night and it's hard to rest? 3rd and Fairfax. Now, there's still oil down there, but they're not allowed to extract it. And anybody who's been foolish enough to build a structure with anything underground has had tar and oil seeping into the corners of their basement. In recent years, pretty much all development as been on the surface of the land—especially since a methane gas leak caused a newsworthy explosion at the Ross Dress for Less across the street in 1985. 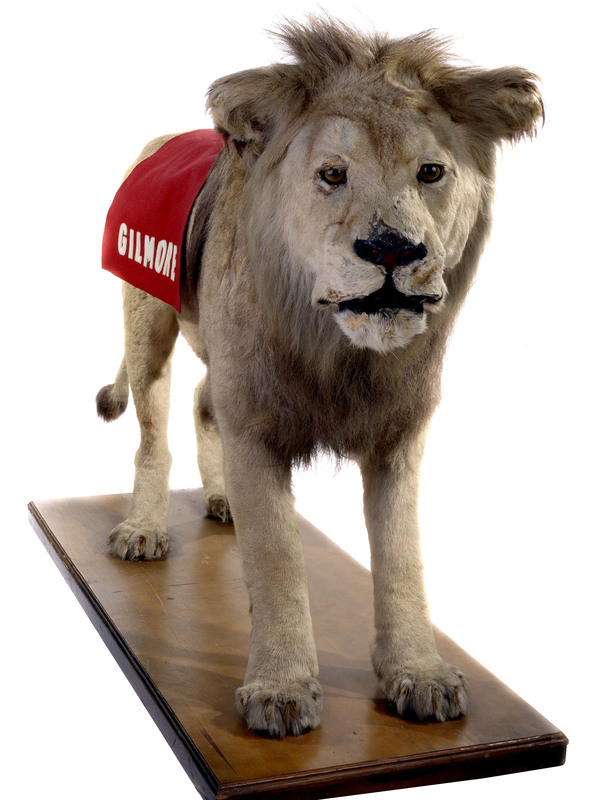 Gilmore the lion was stuffed after he died, and the taxidermy version of him is now part of the permanent collection of the Smithsonian Air and Space Museum in Washington, D.C.
No one lives in the adobe anymore, but actually the structure is still there and intact—tucked behind some restaurants and trees. It was converted from a residence into offices for the A.F. Gilmore Company back in 1976, and they've only temporarily vacated it while it's undergoing an earthquake retrofit. Stay tuned for photos from the completed, earthquake-proof adobe in a couple of months.